Single-factor authentication could be putting your organization at risk. Two-factor authentication (2FA) provides an extra layer of protection. However, it is not the sharpest security knife in the drawer, particularly if the second factor is delivered via text message. 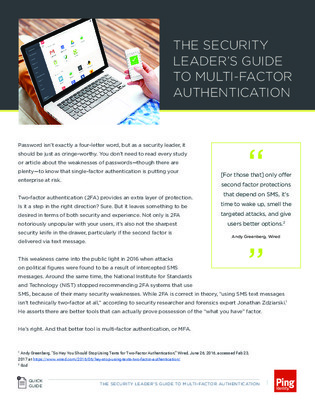 Multi-factor authentication is a more advanced tool because it provides multi factors, not just a single static means. MFA aims to hit the trifecta of security, cost and user experience. MFA was made to reduce the risk of breaches, lower costs and deliver a better user experience.